Airdrops: Helpful or Harmful for Crypto ICO Marketing? Airdrops aren’t all upside – here’s why. Plus, get two effective tactics for growing your Telegram community. An airdrop creates publicity for your crypto ICO in exchange for free tokens. But do they attract the right kind of investor to your blockchain project? Sure, sending tokens en masse to wallets increases your holder diversity. It’s also a popular way to make your exchange listing more attractive in the short term. The funding for ICOs surpassed the 2017 annual totals of 6.3 billion by Q1 of 2018, so this might seem an essential tactic in today’s market. But what airdrops provide in volume, they lack in substance. The goal of marketing your crypto ICO isn’t to attract the largest number of freeloaders – but to secure quality investors. With community engagement so critical to ICO success, inviting these flighty users can disrupt your goals for growth. You bloat your group with un-engaged members, resulting in a stagnant Telegram channel. People with shiny object syndrome contribute nothing and degrade the potential for conversation. You artificially inflate your member base. This makes it impossible to gauge your growth rate and potential. Most of these people will leave after the airdrop, and take any chances of gauging the health of your channel with them. Airdrops increase transaction fees for blockchain networks and scare away potential investors. According to Cointrust, ETH network fees have increased by 10,000% in recent months. While no quick fix, these growth strategies allow you simultaneously engage with and expand the value of your community. 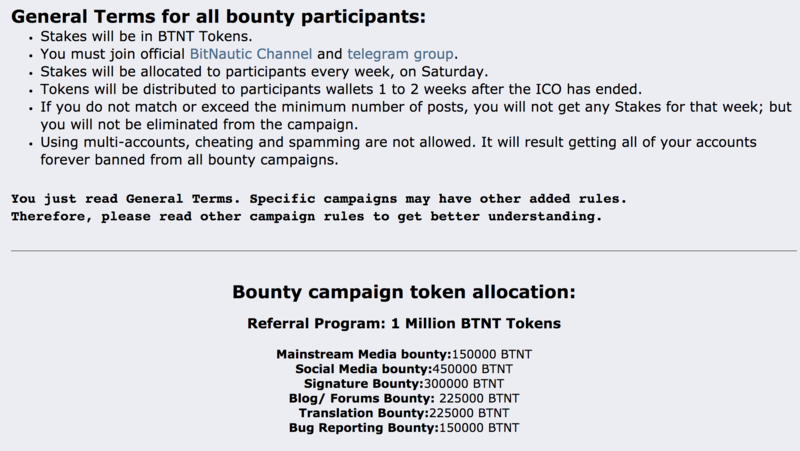 A bounty program uses the self-interest of current members to grow the community. Also called a referral program, the referral incentive is additional coins, payable after the ICO. Your Telegram will grow faster and stronger if members spread the word. In fact, research shows that people trust the word of fellow consumers far more than communications from brand representatives. The social proof of actual investors will help to both expand your audience and strengthen the loyalty of your recruiters. Your bounty program should incite and reward the community for autonomous growth. Hence, you’ll want to allocate rewards for each of your marketing channels. It’s important to let recruiters use their preferred platform, as this is where they’ll have the greatest impact. For example, users could blog on Medium, post on social media, or host a live marketing event. A diverse approach will allow you to generate interest across multiple channels and drive optimal growth. Below we see BitNautic outline their bounty allocation pool on BitcoinTalk. Whether your bounty page is on your website or BitcoinTalk, give referrers all the information needed to get started. Detail the payoffs, the bounty dates, and token allocations by marketing channel. 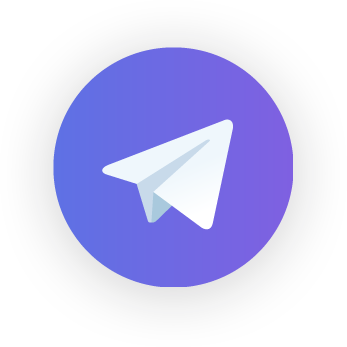 Though a bounty lets you expand your Telegram, this growth isn’t organic per se. Since recruits arrive via an unknown third-party, they’re more likely to churn than those who found your group through a personal contact or personal research. Keep in mind that some may try to take advantage of your bounty program. These individuals will use multiple or false accounts to pad their signup numbers. It’s important to establish a protocol that allows you to verify the newcomer, the referrer, and way they’ve arrived at the bounty program. 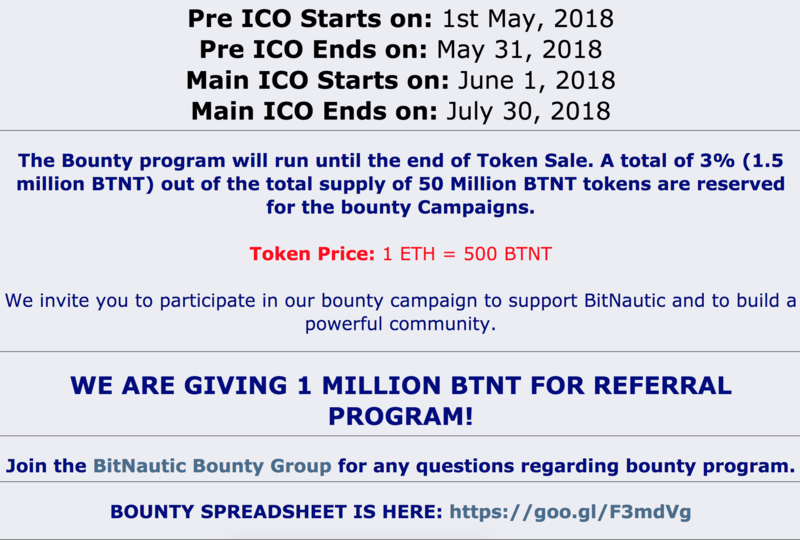 In the following screenshot, BitNautic details the terms for bounty participation. It establishes the general rules, then points to the platform-specific engagement rules farther down the page. Make it clear that spamming will not be tolerated. Crypto investors are aware of bounty programs and consider them when invited to join a blockchain group. This will help you avoid any perceived loss of credibility with potential members and preserve your brand name. A tool like Protodrop will save you time by automating the bounty program. An ambassador program turns your most engaged members into micro-influencers. The ideal candidate has reach and sway in the larger community, and can provide access to a wide network of would-be investors. For example, these people could host a live event, organize a hackathon, or generate support with content or social media. An effective ambassador program enables you to decentralize your marketing efforts and spark growth in an organic, sustainable way. The quality of group members that ambassadors deliver is usually high. After all, ambassadors are the pillars of your community. As referrers, their influence extends to people of like circumstances – in terms of income, interests, and geographic location. They are magnets to those near and similar to themselves, people likely to stick around. In this way, ambassadors help you to both attract and retain your audience. To solicit ambassadors, put out a call in the group chat with a link to your website’s program page. 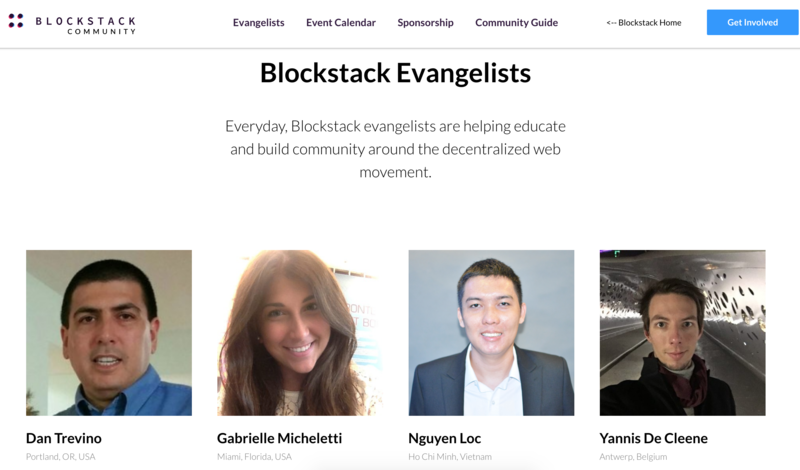 In the following example, Blockstack encourages signups by featuring the faces of current evangelists. The thumbnails both welcome potential ambassadors and reinforce the legitimacy of ambassadorship. It also lets people reach out to these members with any questions. Aim to make prospective ambassadors feel valued and supported. Offer to bring them into the inner circle, and promise them the resources needed to succeed. This encouragement is key for enticing participation. 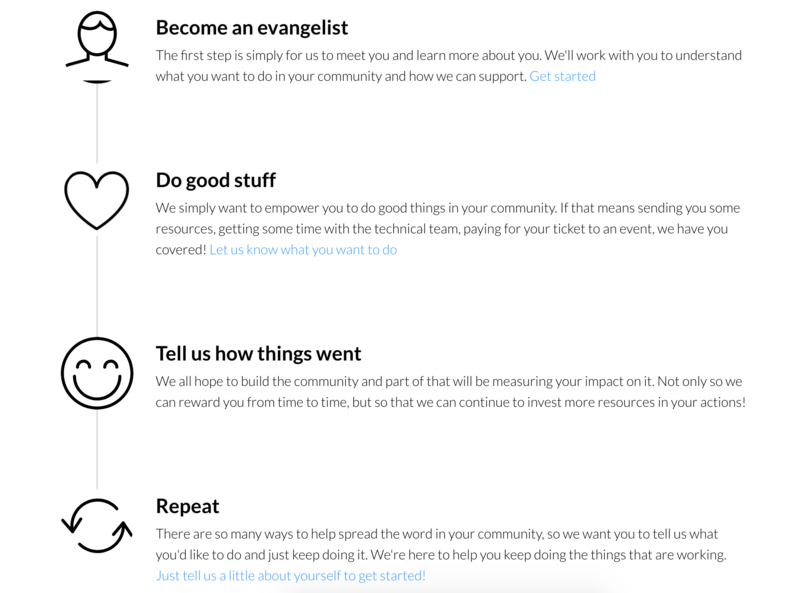 Here we see Blockstack outline the steps for joining its program. Giving a visual roadmap helps to remove any uncertainty around the program. Before dubbing the applicant an ambassador, you’ll want to vet them to determine their efficacy. Your call to action should connect to a data collection page that asks for the necessary details. A strong candidate has a strong social following, can produce valuable content, and offers a personal network of ready investors. After collecting data with your signup form, schedule a call with this person to assess whether they’ll be a good fit. Some say there’s no such thing as bad publicity, but airdrops can have serious repercussions on your crypto community. Crypto marketing is best done in a way that encourages organic growth. After all, the fabric of a resilient Telegram group is threaded with people who actually care about your project – not just free tokens. Ambassador and bounty programs allow you to better target your ideal users while allowing visibility of the growth and health of your community.